Jaden Daly, the most prolific New York City Metro college basketball writer/blogger/play by play announcer around, is graciously again guest blogging on The College Hardwood. With Fordham traveling to North Carolina to take on a streaking Davidson team tomorrow evening, Jaden gives an inside look at a now surging Rams team that has won three out of its last four games. Jaden has covered in person SEVEN Fordham games this season. No one, and I mean NO ONE, knows Fordham better than Jaden Daly. Enjoy! Hello again, everyone, Jaden Daly from A Daly Dose Of Hoops here, giving you my traditional yearly look at the Fordham Rams, who come to Belk Arena this Saturday to take on Davidson for the first time in Atlantic 10 play. Covering the Rams on a regular basis as I do, it is my hope to give you a better idea of what the Wildcats can expect from their latest new opponent. Even though he has a better frontcourt than in years past, Tom Pecora will still employ his traditional three-guard set, a system he admits he is, at times, stubborn to change because of how well it has worked for him, both at Fordham and at Hofstra before that. Junior Mandell Thomas will be the first of the three guards in Fordham's offense. A combo guard from Rochester, New York; whose father, Chad, played at Rhode Island and was recruited unsuccessfully by Pecora, Thomas just recently moved to the point guard position after an ineffective showing by freshmen Antwoine Anderson and Nemanja Zarkovic inspired Pecora to try a different hand as the Rams' floor general. Thomas has been the best athlete on the team since arriving at Rose Hill, and he has used his explosiveness to his advantage since the middle of his freshman season, when he was inserted into the starting lineup. Now, Thomas is still adjusting to being more unselfish, and more of a facilitator. This is not to say he is completely sacrificing his scoring, but he is focusing more on his ancillary numbers in the rebound and assist departments as of late, then worrying about points as they come. One thing Pecora has always been to a fault, and Gary himself will attest to this from years of watching Hofstra, is loyal to his seniors. That alone is the biggest reason why Bryan Smith continues to get the playing time he still receives, despite being an enigma on the floor more often than not. Much like the proverbial box of chocolates that was so vividly described in "Forrest Gump," you truly never know what you're going to get from Bryan. One night, he'll give you 15 points and knock down several clutch three-pointers, the next, he'll struggle through a 1-for-8 outing hampered by foul trouble. Pecora often laments Smith's inconsistency, yet for four years, has believed in the kid, hoping he would find a way through. Fordham's third guard is one who should play as more of a forward, yet settles way too often for shots he should not be taking. That, for those who don't know, is Eric Paschall. A 6-6 swingman who came to the Rams after winning Mr. Basketball honors in the state of New York, Paschall is a player who is at his best when he attacks the basket and drives inside against bigger competition. However, he decides on way too many mid-range and outside shots, something a player of his physique should be much less reliant on. In spite of his questionable shot selection, his raw talent alone has enabled him to be Fordham's leading scorer, and the frontrunner for Atlantic 10 Rookie of the Year honors. If you paid attention to the A-10 last year, you probably know who Ryan Rhoomes is. If not, he's a 6-8 junior that has such a distinct nose for the ball to the point where he can, and more often than not, does, end up with anywhere between ten and fifteen boards per game. Rhoomes has become one of the more underrated big men in the A-10, and that is a credit to his relentless work over the summer in becoming more of an interior presence, something Fordham has admittedly struggled with finding and maintaining throughout Pecora's tenure. The Rams' biggest surprise, though, is Rhoomes' frontcourt partner, Christian Sengfelder. A 6-8 German power forward, Sengfelder is unique in his ability to space the floor while coming up with rebounds and a deceptively strong outside shot. In his last five games prior to Fordham's most recent win against George Mason Wednesday night, Sengfelder had been averaging a double-double, and has a 16-rebound performance on his ledger against a UMass team led by a walking double-double in his own right, Cady Lalanne. When watching Sengfelder, pay attention to what he does away from the ball before it gets to his hands. While Eric Paschall commands most of the attention, it is his German teammate who is the more polished player, and something Fordham fans have been very satisfied with since his debut in November. The Fordham bench looks a little different this season, most notably with the presence of Jon Severe. The sophomore guard, who was the star of the show as a freshman last season alongside Branden Frazier; who has since turned pro, has taken on a new role as somewhat of a high-energy reserve upon returning from a month-long leave of absence. Severe had a string of five consecutive double-figure scoring games before the Rams took on Richmond last week, so his scoring is starting to come together as well. The aforementioned freshman point guard duo of Antwoine Anderson and Nemanja Zarkovic offer a stable hand at the point guard position, but not much else in the way of scoring. In fact, since Mandell Thomas was moved to the starting point guard spot, Zarkovic has seen his minutes drastically decrease. Forwards Manny Suarez and Dekeba Battee-Aston are slowly learning the ropes in their freshman seasons, but neither one is active on the floor for a long period of time, simply used as a fresh body if either Rhoomes or Sengfelder is plagued by foul trouble. Fordham is a much stronger team up front than in years past, which is a quality Pecora has lacked since his early years at Hofstra, and that even included the three years he got from Chris Gaston when coming to Fordham. The presence of Rhoomes and Sengfelder, and Eric Paschall when the Rams play a smaller lineup, gives Fordham the flexibility to impose their will on teams on both ends of the floor, one of the biggest reasons why the Rams have rebounded to win three of their last four following an 0-9 start to the A-10 schedule. From a weakness standpoint, one thing the Rams struggle with aside from shot selection is turnovers. When facing a team that likes to press, as was the case against St. John's, Manhattan and VCU, Fordham tends to look like a deer in headlights, and commits way too many careless miscues than they should. If the Rams can handle the ball well, they play at their best. I've been admittedly critical of Pecora in recent years as he attempts to rebuild a program that has been in a two-decade-long morass since joining the Atlantic 10. Still hopeful of reversing the Rams' fortunes, Pecora appears to have bitten off more than he can chew sometimes, but in recent games, it seems as though Fordham is, slowly; but surely, turning a corner. Granted, Saint Louis and George Mason were not picked to finish near the top of the league this year, but the Rams' victory over reigning A-10 champion Saint Joseph's, projected at the beginning of the year to be a team in the postseason conversation, may have been the most impressive example of Pecora's eternal hope that it can get turned around in the Bronx once and for all. Fordham's guards have a refuse-to-lose mentality when they realize they are in a winnable matchup. Mandell Thomas and Bryan Smith have had an experience edge in recent games, which should give them confidence against a Davidson team that some may say has overachieved in their first season removed from the Southern Conference under longtime mentor Bob McKillop, for whom Tom Pecora worked as an assistant coach on the Long Island high school circuit in the 1980s. While their recent surge has begun to dispel the notion that the Rams are in over their heads in a strong A-10, Fordham remains a work in progress. Playing on the road might be an even bigger weakness for this team, as for some reason, the Rams have had a hard time away from Rose Hill Gym. In fact, Wednesday's win over George Mason was just the second road win in A-10 play during Pecora's near-five-year tenure, the only other one coming at St. Bonaventure in 2013. Fordham has never seen a team like the Wildcats, which is both a blessing and a curse. If this game was played a month ago, Davidson would win handily. Now, I don't know if I can still say that, as Fordham's ever-growing confidence and group of veterans who are starting to tap into their potential will make this a close game that will ultimately come down to the final two or three possessions. Four years ago today, I got one of the best birthday presents of my life. Behind "The Wolf", as Jerry Beach affectionately calls him, Charles Jenkins hit not one but TWO buzzer beaters to defeat William and Mary in overtime. It was during that magical 2010-11 Hofstra season which provided Hofstra fans with so many memories, especially of the best player ever to don a Pride/Flying Dutchmen uniform. That Hofstra team really never gets its true due. They won fourteen regular season games in the CAA that season, tied for most ever for the Hofstra program in Colonial Athletic Conference play. The Pride finished third in conference in regular season, a conference where three other teams; VCU, George Mason and Old Dominion made the NCAA Tournament. We all know what VCU did, but Mason won a second round game against Villanova and Old Dominion had Butler on the ropes before losing on a buzzer beater. The Pride accomplished that 14-4 conference record and 21 win season arguably with lesser talent than the season before, as CAA All Rookie team members Chaz Williams and Halil Kanacevic tranferred after the 2009-10 season. It was due in large part to Jenkins, a better team effort and better coaching by first year coach Mo Cassara. I will say to my last dying day that what Cassara did that season was one of the best coaching jobs I had ever seen. But what happened that day February 15, 2011 didn't end with that season. On that night four years ago, I got the gift that keeps on giving. That was the first Hofstra basketball game I brought my then five year old son Matthew to that night. 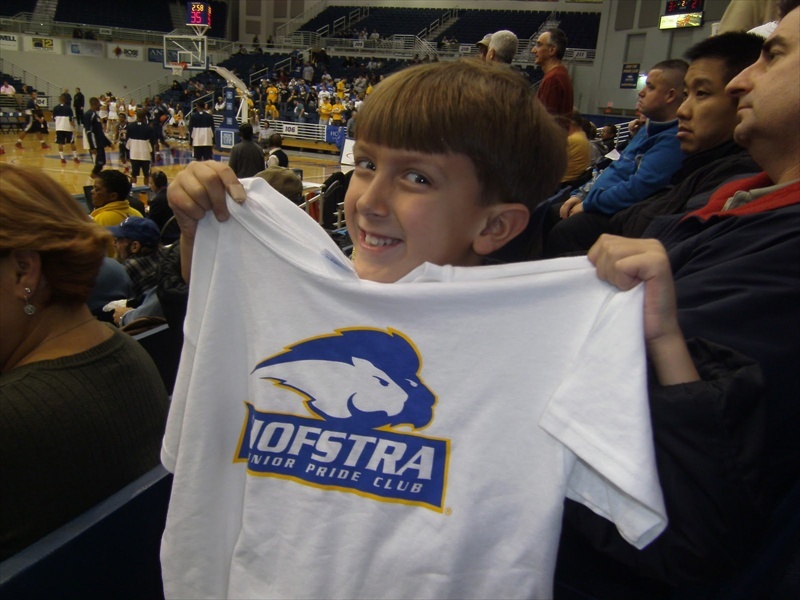 For the longest time, my older son Matthew didn't want to go with me to Hofstra games. I finally convinced him to go as a favor to his dad for his birthday that night. Matthew would start going with me to basketball games. A lot of basketball games. In fact, the next season that I covered fifty nine Division I games for my site and the Mid Majority, Matthew went to thirty three of them with me. He was my ever present sidekick along with his little brother at Iona Women's basketball games. The kid rooted for Hofstra, Iona (loves Scott Machado) and VCU. But it was not just watching basketball, Matthew played basketball. He would go home and dribble a ball until he went to bed. He would play in the back yard. He loved going on the Hofstra court after the game. When we moved to South Carolina, Matthew became very involved in his first love, baseball. He has played baseball ten months of the season for the past two years. It's left him little other time for other hobbies and passions like basketball. Matthew has become a very, very good baseball player, who has made his Little League All Star team twice. He also won a Minors Championship for his team I co-head coached last Spring by scoring the winning run in the bottom of the sixth inning of a truly fantastic championship game that we won 4-3. He started that bottom of the sixth inning with a hard double down the third base line. As a dad, there is no prouder moment than having your son cross the plate to win a championship and then having him jump into your arms. But that night of February 15, 2011 is equally a proud moment. And four years later, Matthew finally got to play basketball in a league. He plays for the Upward Bound basketball program at Shandon Baptist Church here in Columbia, South Carolina. Matthew actually plays with one of his travel ball teammates, Wil on his basketball team. They were also teammates on the District 3 Champion Coach Pitch All Star team last Spring. In his first season of playing basketball, Matthew was not as experienced as some of his teammates. But he caught up very quickly due to his athleticism, which he certainly didn't get from his Dad. Matt is one of the better defenders on his team, likes to set picks and he loves to pass. So much so, his coach has Matthew bring the ball up the court now. So I have a nine year old point guard. How cool is that? But until yesterday, Matthew had not scored in a game all season. Matthew had numerous opportunities, but his shots wouldn't go in. A few unkind rims and a few rushed opportunities. Matthew wasn't done however. He would hit three more baskets, one on a pretty feed from his teammate Mark that found Matthew all alone in the paint for the easy deuce off the glass. Matt finished his day with another coast to coast layup. He had eight points, a few assists and one very proud mom and dad. The video is Matthew getting a pass from a teammate and hitting a jumper for two of his eight points. His team won going away and his friend Will added twelve points. A good day for the Columbia Thunder baseball teammates. Matthew works at basketball every day. We bought him a basketball hoop for Christmas and it stands off to the side in the driveway. When Matthew was younger, we would play H-O-R-S-E with a smaller hoop in the backyard of our house in North Bellmore. Because I wanted him to learn the right way and earn his victories, or because I guess I am too competitive, I would beat Matthew in that game just about all the time. Not anymore. Matthew beats me regularly. After the game yesterday, we drove home. As his younger brother Jonny and his mom went inside, Matthew grabbed a basketball and hit a layup on his home court hoop. H-O-R-S-E game on. Matthew and I traded baskets for the next twenty minutes. I was having a good shooting day. But with three exceptions, Matt equaled me whenever I hit a shot. And three times, Matt nailed shots then I missed. We were tied at H-O-R. 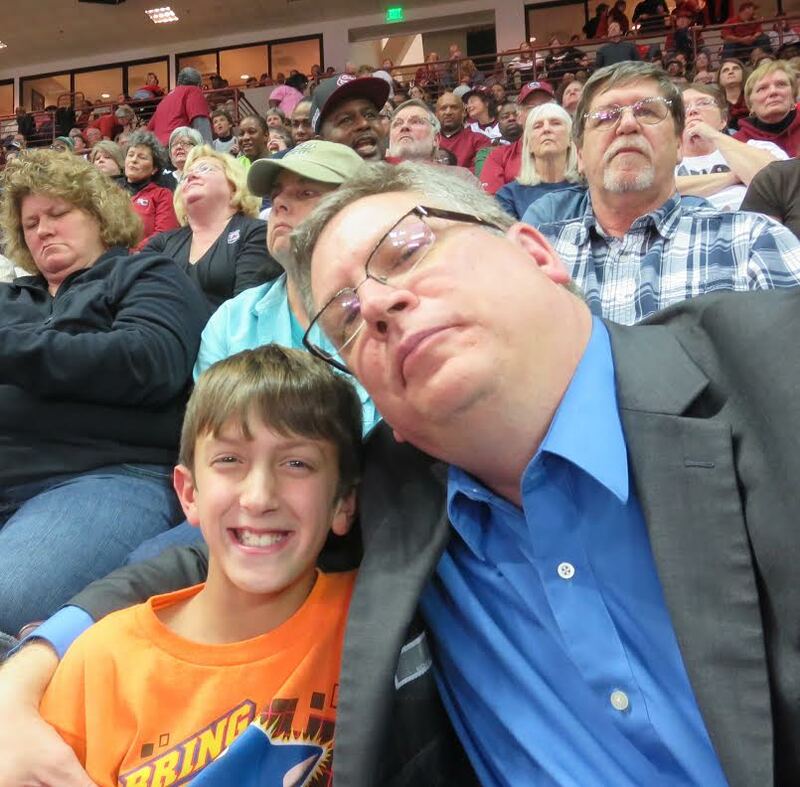 But after playing thirty six minutes of basketball (Upward Bound Basketball plays eighteen minute halves, only stopping for fouls and substitution breaks after six minutes) and then another twenty minutes with this game of H-O-R-S-E, Matthew was spent. Plus we had baseball practice at 1:00 PM. So we went inside and called it even. Four years ago today I got a birthday gift that has kept on giving, my older son's love of basketball. It's a gift that I hope keeps on giving for a long, long time. Charles Jenkins, Mo Cassara - Thanks. PS - It was a birthday Tweet from Jaden Daly which included a reference to the Feb 15, 2011 game that inspired me to write this post. Thanks so much, Jaden, for the inspiration. Yesterday made it come full circle for me. Can Hofstra Get Back on the Track? I lived on Long Island, New York for forty six years. If you live or have lived on Long Island, you are no doubt familiar with the LIRR, the much aligned Long Island Railroad that takes thousands of passengers on a daily basis to and from New York City, Brooklyn, Queens and various stops, via various train branches on Long Island. The last twenty years of my life I lived on the south shore of Long Island, first in Seaford and then in Bellmore when we bought our house. Those are two stops on the Babylon Line. I moved to Columbia, South Carolina in August of 2012. The LIRR trains have been replaced by freight trains which seem to run as often as the LIRR, but probably more reliable and more on time. The one difference is that you don't want to be caught at a railroad crossing with a freight train coming through. Some of them are really a "Long Train Running". It was our first time ever at Alumni Gym on what looks to be a very pretty campus. Elon's Alumni Gym was built in 1949, which from other than the old style ceiling with the metal lamps hanging from the ceiling, you could not tell it was built in 1949. That's because the gym was recently renovated for stadium style seating and electronic scoreboard in each of the four corners of the gym. It's more like an intimate arena, which seats 1,607 fans. It's one of the nicest venues I have seen in my ten years of covering college basketball for this blog. Well done, Elon, well done. Elon entered the contest at 2-1 conference play, which included an 85-79 home win over William and Mary Thursday night. Hofstra entered the game at 3-0 in conference play, after their come from behind win over the College of Charleston on Thursday night, another game Tieff and I attended . After an absolutely terrific version of the Star Spangled Banner by the all female Elon University a cappella group, Sweet Signatures, the start of the game saw Elon take an early 4-0 lead on baskets by Ryan Winters and Austin Hamilton. The Pride would finally score their first basket a little more than three and half minutes into the game on a layup by Dion Nesmith. The Phoenix would maintain the lead for the first nine plus minutes of the half as Tony Sabato led the way with a three point play and two assists. Elon held Hofstra to five of twenty one shooting during that time span as the Pride simply couldn't get anything going on offense. Finally Hofstra broke through on Elon and it was their dynamic Niagara duo of Juan'ya Green and Ameen Tanksley, leading the way. Tanksley and Green buried several threes to help put Hofstra up ten, 25-15. The Pride would add to their lead as the fouls mounted on the Phoenix, much to the chagrin of the Elon fans, who let the referees know their displeasure with the calls. A Brian Bernardi three pointer extended the Hofstra lead to sixteen, 36-20. The Pride would cap their first half with three more free throws to take a 39-25 lead at the halftime. In the second half, Hofstra was still up fourteen, 51-37 with about thirteen minutes left. But the Phoenix finally arose, starting a 9-2 spurt to cut the lead to seven, 53-46. Alumni Gym suddenly got very loud as the Elon fans showed how well the intimate arena holds sound. However, the Pride responded with an 11-0 run, which put Hofstra up 64-46 with 7:45 left in the game. The run was highlighted by excellent ball movement by the Pride as they did a great job of rotating the ball around to find the open man. From there, Elon could get no closer than fifteen the rest of the way. Similar to the way they ended the College of Charleston game, the Pride were very solid from the line down the stretch, hitting seven of their eight free throws for the very impressive 79-61 road win over the Phoenix. The Pride again showed their three point prowess as they went fourteen of thirty two from beyond the arc. Hofstra had left North Carolina in first place in the CAA at 4-0 and 13-4 overall. They were ranked high in KenPom, 72 after the win over Elon, a team that has only won one CAA conference game since. Everything was going Hofstra's way, especially having won three of their four conference games on the road. The Pride had a large contingent of fans at the game vs. the Phoenix. I have no doubt that Hofstra's faithful happily drove home back to New York that night thinking that the Pride would end that fourteen year drought of not making the NCAA Tournament. The Flying Dutchmen train was riding at full speed down the Colonial Athletic Conference tracks. Then the train got briefly stopped at a northeast station. Hofstra suffered a tough eight point loss, 81-73 at Northeastern. The game, which was a battle for first place at the time, was tied at the half and Hofstra was up 69-68 with nine minutes left before the Huskies went on an 11-0 run to win the game. No shame in losing to one of the preseason favorites in the CAA. Then the Hofstra train came back to Hempstead for the game at home vs. UNC Wilmington, a team they had beat only a few weeks prior. A little repair work at the Mack Center and the Flying Dutchmen train would be back on a roll. And for a while, it sure seemed that way. The Pride were up five at the half, 38-33 and led by six, 69-63 with 5:42 left in the game. The Seahawks then went on an 11-1 run over the span of four minutes and forty seconds. The Hofstra D became non-existent, while their offense, which consisted mainly of three point shooting, went ice cold. The Pride still had a chance to tie late, but Green missed a crucial free throw that would have tied the game at 75 with thirty four seconds left. Forced to foul, the Pride would go on to lose the game 79-74. Head Hofstra Train Engineer Joe Mihalich made some adjustments for the next home game vs. Drexel and the Pride responded with possibly their most balanced offensive game of the season, an 86-58 pasting of the Dragons. The Pride made a more conscientious effort to work the ball to their bigs, which resulted in Hofstra shooting twenty six of forty four from two point range. Combine that with fifteen steals and thus a twenty eight point win. With the train seemingly back on track, Hofstra had another home game vs. James Madison. For the first twenty minutes, the Pride offensive locomotive was chugging away at full speed. The Pride had a 45-33 lead at the half and still led by twelve, 52-40 with 16:30 left in the game. Then the Dukes made a run, while the Pride, content to chuck shots from beyond the arc, went frigid. The result was a 14-0 JMU run over nearly five minutes that put them up 54-52. Moussa Kone would get the Pride back up later 61-59 with four and a half minutes left. He would also score their final basket to tie the game at 63. But JMU would score the last six points of the game while Hofstra continued to clank shots from the outside, missing their last six shots, all three point attempts. The Dukes would win 69-63. From there, the train would completely derail. Hofstra would get hammered in Williamsburg by the first place Tribe of William and Mary, 100-79. From there, the train limped back home to Hempstead. Perhaps, the Pride locomotive should have stayed in the shop instead of playing the Towson Tigers. Up one, 38-37 at the break, Hofstra wilted under the dominance of Towson's frontcourt. The Tigers scored fifty second half points, shot fifty eight percent from the field, including sixty two percent from two point range and outrebounded Hofstra 41-23. The result was another home loss 86-72. After a 4-0 start, the Pride had lost five of their last six games to become .500 in conference. What had been a great beginning to their conference season had now seemingly gone up in flames. From 13-4 to 14-9 just like that. The question was, could Hofstra show the mark of a good team and respond to adversity. Hofstra did rebound to win their next two games, a ten point road win at Delaware and an eleven point win at home over Elon. Then they had a golden opportunity, a win at home on national TV (NBC Sports Network) vs. Northeastern and they would be in a tied for third with the Huskies and the Dukes of James Madison. But despite shooting fifty percent from the field, hitting the same number of two point and three point field goals as the Huskies, the Pride lost 79-68. Despite FIFTEEN steals, Hofstra couldn't stop Northeastern late on Huskies' possessions. They also got killed again on the boards 33-17, allowing eleven offensive rebounds and numerous second chances for the Huskies. So after thirteen games, the Hofstra train is stalled at the Hempstead station at 7-6 in conference, sixth in the CAA and 16-10 overall. Their KenPom ranking had dropped to nearly double of what it was after the Elon game, 142. So what happened? Why is such an offensive juggernaut, the Pride, first in CAA scoring, second in three point FG percentage, first in assists per game and first in turnover margin, which includes first in the CAA in steals per game, struggled so much over the past nine games? When you look under the hood, it's three things. One, it is clearly the defense, especially the interior defense. You didn't really see these issues during the non conference season and that was partly due to the non conference schedule the Pride played. Only North Carolina State (55) and LaSalle (81) have rankings in the Kenpom top 100 in Hofstra's non conference opponents (William and Mary is the only conference opponent in the top 100 in Ken Pom at currently #89). The Wolfpack defeated the Pride by twelve, 76-64, while the Explorers defeated the Pride 83-74. Their other two non conference losses came at USF 71-70 after blowing a late second half double digit lead and an 82-77 loss at Columbia where the Lions hit thirteen three pointers. So I have looked at their ten losses and for the most part, there is a common thread. In seven of the ten losses, Hofstra has been outscored in points in the paint, often by large margins. Only in two of the losses, Columbia and Towson, did Hofstra outscore its opponent in the paint, while in Thursday's game, both Hofstra and Northeastern scored forty four points in the paint. Five times Hofstra has been outscored in the paint by ten or more points. Five times, Hofstra has allowed forty or more points in the paint. Only once did Hofstra score more than forty points in the paint in their losses (last game vs. Northeastern). Two, over reliance on the three point shot. Hofstra is second in the CAA in three point shooting at 37 percent. But when the Pride goes cold from beyond the arc, their offense struggles. In their ten losses, outside of the one point loss to USG and their first game against Northeastern, the Pride have not shot their season average from beyond the arc, often times not even close. Often it's very cold second halves that do Hofstra in. Against James Madison, they shot 2 of 15 in the second half from three point range. Against Towson, they shot 1 of 11 in the second half from beyond the arc. In only one game did they shoot less than twenty 3-point attempts. 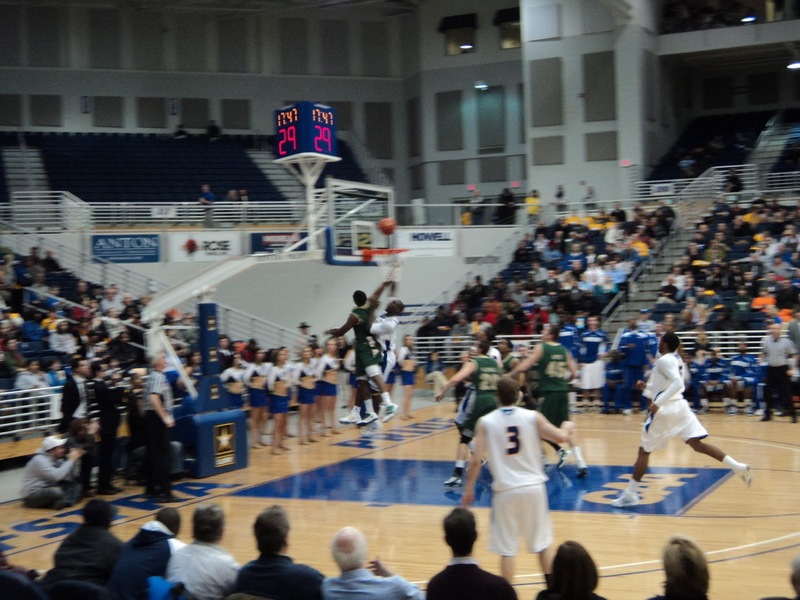 In seven games they attempted twenty four or more three pointers, Hofstra has BY FAR attempted the most three pointers in the CAA, with six hundred and thirty one, ninety six more than the next closest, William and Mary with five hundred and thirty five (Hofstra has played one less game in conference). Hofstra averages twenty four 3-point attempts per game. It's the old adage, you live by the three, you die by the three. The Pride, having so many talented guards, will often play a four guard set of Green, Dion Nesmith or Jamall Robinson, Brian Bernardi and Ameen Tanksley. Tanksley will play the four and one of their forwards, Rokas Gustys, Moussa Kone or Malik Nichols playing the five. Now while that creates matchup problems for opponents when Hofstra spreads the floor, it also creates problems for the Pride when it comes to, as noted, interior defense but also rebounding. In only three of the games, USF, the road game vs. Northeastern and William and Mary did Hofstra have more second chance points than their opponent. As noted, they had a double digit lead against the Bulls with four minutes left in the game before losing a game they never should have lost. In the road game vs. the Huskies, Northeastern didn't have many second chance points, since they shot nearly sixty four percent from the field. Likewise, William and Mary shot sixty five percent from the field against Hofstra. There is hope. Hofstra scored forty four points in the paint in their loss to Northeastern, which was the third most on the season (Hofstra scored forty six points in the paint vs. Jacksonville and fifty points against Drexel). The Pride made a concerted effort to work the ball inside to Gustys, Kone and Nichols. Gustys had his best all around game as a member of Hofstra with thirteen points, five rebounds, four steals and two blocks in twenty four minutes of action. Nichols added twelve points and Kone chipped in with seven points. They combined to score thirty two points, fourteen more than their season average. Watching the Northeastern game on television, Hofstra at times played very good defense. They had fifteen steals and were often very active and aggressive against the Huskies. But as the announcers noted, they would let up towards the end of the possession, not communicate well at times on defense, as defenders failed to step out on ball screens and they didn't play help defense when Scott Eatherton got the ball in the post. Eatherton was eight of ten from the field. If they play Northeastern again in the CAA tourney, Hofstra needs to double down on Eatherton when he gets it in the post. Brian Bernardi is a terrific shooter, but if he is not hitting the three pointer, the Pride are much better off defensively with a rotation of Green, Nesmith at the three, Nichols at the four and Kone or Gustys at the five. This is due to Nichols being much quicker than Bernardi on defense and having more length than Tanksley at the four. Nichols was much more of a matchup problem for six foot six Northeastern guard David Walker than Bernardi. Walker had a field day when Bernardi was guarding him. The Pride have enough offensive firepower to offset Bernardi being on the bench more. Plus they showed that Gustys is capable of giving them double digit scoring against a good front line like Northeastern's, which, to be honest, is rare in the CAA. It gives them better balance and better defense. Keep feeding the paint, Hofstra. The good thing about the CAA is now there are only ten teams, which means six teams now get a bye in the first round as opposed to a few years ago, when only four teams got a bye. Hofstra is right now in the sixth spot and can right itself for the CAA tournament. They will likely have to face both William and Mary and Northeastern in the the tourney to get to the NCAA Tournament anyway. It's going to be defense that gets them there. They can start that defensive trend against Drexel today. Let's see if they can get the train rolling again. Alan Kelly is a proud alumnus of George Mason University, and writes about Patriots basketball for MasonHoops.com. You can follow him on Twitter at @MasonFanatic. As the Davidson Wildcats navigate their rookie season as member of the Atlantic 10, they can look to recent additions George Mason and VCU for expectations, both positive and negative. A season ago, as George Mason played the role of A10 newcomer, one refrain that was cited numerous times by head coach Paul Hewitt and some of his players was the increased intensity needed to win night in and night out. The Patriots came into a deeper league than the one the Wildcats find themselves in this year, but the same lesson still applies: There are no easy games, and you can’t afford to have an off night, especially on the road. Likewise, travel in the league can be a grind, with a larger footprint than the CAA, and a much larger footprint than the Southern Conference. The team could get from Davidson, NC to almost anywhere in the SoCon by bus within a reasonable amount of time, but now some charter plane flights are inevitable, and adding more will be desirable. George Mason athletic director Brad Edwards recently indicated to the Washington Post that the program is seeking to increase funding to add additional charter flights. No example of this need may be more striking that the five-plus hour bus trip the Patriots took midweek to play at Duquesne in Pittsburgh last month. Mason ended up shooting under 15% in the first half and under 25% for the game in a nearly unwatchable defeat. The two recent losses suffered by the Wildcats, on the road at St. Joseph’s and at home to St. Bonaventure, should not be a surprise, and they probably won’t be the last head-scratchers suffered by what is a young roster aside from senior Tyler Kalinowski. In order to navigate these pitfalls, one of the best assets is senior leadership. In 2012-13, VCU had an excellent pair of senior guards in Darius Theus and Troy Daniels. The following season, George Mason timed its 2013-14 move to the Atlantic 10 to coincide with a senior class that included Bryon Allen and Sherrod Wright, who combined to average over 30 points per game. One hesitates to ask how rough matters might have been for the 11-win Patriots without those two leaders. Second, but not less important, coaching matters, and the Wildcats lack nothing in that department. While coaching is not the only difference between the two programs, it’s no accident that VCU and Shaka Smart made a smoother transition to a higher level of basketball than George Mason and Paul Hewitt did. Bob McKillop has a fantastic track record, and while no one should expect Davidson to become VCU overnight, he knows how to win. Short term, win or lose, there are at least three facets of a program that see immediate impacts from a significant upgrade in conference alignment: attendance, scheduling, and recruiting. Attendance can be a double-edged sword. A better league draws better home opponents, which yields more interest for casual fans, but a tougher schedule also makes it harder to maintain homecourt dominance. For George Mason, in the run up to the move to the Atlantic 10, there was a lot of excitement among fans about the better quality of opponents who would be visiting the Patriot Center, and a corresponding spike of nearly 8% in attendance last season. However, once the reality of losing set in, home attendance in 2014-15 is down over 15%. In Richmond, VCU had already established a culture where sellouts were the norm, and because they were able to sustain their success, demand for tickets only increased. This led to the construction of the Tommy J. West Club Level, which added luxury suites and 120 premium balcony seats to the Siegel Center. Increased fan interest is an opportunity to be seized, but it’s not guaranteed. A tougher league gets you more chances to build a resume with league wins, so out of conference scheduling is not the imperative that it was in the SoCon, but it’s still important for maximizing your chances to impress the selection committee. With a non-league schedule like the one Davidson played this season (ranked 255th), the margin for error becomes slimmer, and that will undoubtedly be something the conference encourages Davidson to improve for future seasons. VCU and Mason have both excelled at scheduling, giving themselves tough slates that this season are ranked first and 15th in the country, respectively. (Of course, you still have to win your fair share of those games, something Paul Hewitt’s squad has failed to do). Back in the CAA, in Paul Hewitt’s first season in 2011-12, multiple RPI-crushing losses to bad teams in November eventually led to a 24-9 team staying home for the postseason. In a league like the A10, that George Mason team would have gotten a second chance to improve their RPI. Recruiting is a strange world, and both former CAA powerhouses have a head coach who is viewed as an excellent recruiter, but being in the Atlantic 10 offers a better platform to compete against the top basketball schools in the country. It’s too early to evaluate the impact for George Mason, but as an A10 member, VCU has pulled in arguably their two best recruiting classes in school history in the 2014 and 2015 classes, with both classes ranked 26th in the nation by 247Sports. Long term, Davidson is favorably positioned for success. While their budget will likely need to increase, and facilities upgrades will be a part of that increase, they can expect higher revenue from television contracts and NCAA tournament shares, and their positioning in the Charlotte media market (ranked 24th largest in the country by Nielsen) puts them ahead of some of their new conference mates, not to mention almost everyone in the SoCon. Davidson may not have the shiny Final Four banners that recent A10 additions like George Mason, VCU, or even Butler had, but they do have a history of NCAA relevancy and success to fall back upon and to market themselves around. Three Elite Eight appearances (1968, 1969, and 2008) from two different eras is an impressive legacy, and with an increased opportunity to earn at-large NCAA bids, nothing says McKillop can’t repeat the Steph Curry run from ‘08. Tonight at Belk Arena, the Wildcats will take on George Mason at 7pm. The rematch of January 24’s 80-73 overtime victory over the Patriots in Fairfax will be a good test for Davidson, as it marks just their second rematch with an Atlantic 10 foe. Will familiarity and a quest for revenge favor the Patriots, or will homecourt advantage and additional experience in playing without the injured Jack Gibbs result in a Wildcat triumph? Since I moved down to Columbia, South Carolina, I have seen the Davidson Wildcats play several times in Belk Arena. A few times, I was able to get there early, have dinner in downtown, Davidson, an experience I highly recommend, then go to the game. Last evening, I had no such luxury of time. Yesterday had been a baseball bonanza of a day. First I had Little League Coach Pitch Baseball evaluations. Over one hundred kids, including my younger son, Jonny, came out to evaluate at Trenholm Park, which happened to be on the same day of a volleyball tournament in the rec center of Trenholm Park. Thus an overwhelmed parking lot. Then a group of coaches, consisting of nine teams went into a room at the rec center building and drafted those one hundred players. That took four hours of my day. But that wasn't all. Then I had travel ball practice with my older son, Matthew, who I coach along with eleven talented teammates and friends playing on their first travel team after having won a district coach pitch title the season before. We took team pictures and then had a strenuous two hour practice. Most people would be exhausted by that time. Nope, Matthew and I had tickets to see one of my favorite teams to watch live, the Wildcats. Wasn't missing that. But the result was that we got to the University a few minutes after the game started. We walked through the beautiful campus of Davidson College and made to our seats at Belk Arena ten minutes in the first half with Davidson leading Duquesne 24-13. When I commented to someone yesterday at the baseball evaluations that I was going to Davidson, he noted about how Stephen Curry put them on the map. He did, leading them to an Elite Eight appearance in 2008 and nearly a Final Four after a three point loss to Kansas. It was actually the third Elite Eight appearance in school history. The other two came in 1968 and 1969 under then coach Lefty Driesell. Both those times they lost close games to North Carolina in the Regional Final. Those three NCAA Elite Eight appearances are still just a sample of the long history of success of the program. When you look up in the rafters of the arena, you can't help but notice all the banners; all the Southern Conference championships, the NIT appearances and the twelve NCAA appearances. Seven of those twelve appearances are a result largely of one man and it's not Steph Curry. It's Bob McKillop, the man who recruited Curry to Davidson. McKillop came to Davidson in 1989 after coaching at Long Island Lutheran High School from 1979 to 1989. I remember that well growing up on the Island. Long Island Lutheran was a perennial power in high school basketball thanks to McKillop. And now Davidson is a perennial power in college basketball and the court is now appropriately named after him. McKillop's teams pride themselves on movement, both with the ball and without the ball. You will screens, picks, back door cuts, nice post passes and most importantly, good shooters. Davidson's offense is truly fun to watch and McKillop is the mastermind behind it. This is Davidson's first year in the Atlantic-10 and Belk Arena shows it. The 5,000 seat venue was practically full for last night's game with Duquesne. The Wildcats entered the contest at 5-4 in conference and 14-6 overall. When we got to our seats, freshman Peyton Aldridge drilled a three to put the Wildcats up 27-15. With the three pointer, Aldridge already had ten points in ten minutes of action. The Dukes would respond scoring five of the next six points to cut the lead to eight, 28-20. Jordan Watkins put Davidson up by ten 30-20. Then things got really wild. Six of the next seven baskets scored were three pointers; three by Davidson and three by Duquesne. Tyler Kalinoski assisted on two of the Wildcats' three pointers, and hit the other three pointer. L.G. Gill capped the three point barrage for the Dukes, banking in a three pointer to cut the Davidson lead to eight once again, 39-31. Everyone thought it was a one time fluke, but Gill would later bank another three pointer at the end of the first half. Whether it was a fluke or not, that's for Gill to know and us likely to never find out. But during the span between the three point bank shots, Davidson went on a 13-4 spurt as Aldridge continued to go to town on Duquesne, scoring another four points in the span. Only Gill's banked three pointer to end the half kept the halftime deficit at fourteen, 52-38. The Wildcats shot sixty percent in the first half, including eight of fifteen from beyond the arc. Duquesne did their best to hang in there, shooting 48 percent from the field in the first half, including shooting fifty percent from three (five of ten), Yet they were down fourteen points at the half. One of the things you notice at a Davidson game is that that the student section often carries flags of other countries. That's because the Wildcats have four players from outside the United States - Nathan Ekwu (Nigeria), Oskar Michelsen (Finland), Ali Mackay (Scotland) and Manu Giamoukis (Greece). Starting the second half, considering probability, you would figure that the Wildcats would slow down scoring wise in the second half . And at least for the first minute and a half, the Wildcats did exactly that, as they went scoreless. The problem was that the Dukes couldn't take advantage and missed on all four of their field goal attempts and turned the ball over once during those first ninety seconds. When you fail to take advantage of scoring opportunities against an offense that's so well disciplined, that moves so well with and without the ball like Davidson, it's playing with fire. And Duquesne got burned as the Wildcats heated up from the field. The Davidson offense played off their three point prowess and got the ball to Aldridge for a couple of post touches and scores. The Wildcats extended their lead to twenty one, 65-44 with fifteen minutes left in the game. Gill buried another three pointer and TySean Powell added a three point play to cut the deficit to fifteen, 67-52 with fourteen minutes left in the game. But that's as close as the Dukes got the rest of the way as Duquesne simply could not keep up with the Davidson offense. The Dukes went ice cold from beyond the arc in the second half, shooting one of twelve from three in the last twenty minutes of the game. Meanwhile, the Wildcats actually matched their first half shooting percentage, shooting sixty percent from the field in the second half. They shot the ball a little less from three, though almost as accurate, shooting five of eleven from beyond the arc. Davidson concentrated more on post play and back door cuts in the second half. As soon as Duquesne converged inside with help defense, the Wildcats would find the open man for the three. Jordan Barham found Kalinoski for an open three to put Davidson up twenty, 79-59 with 9:18 left. The barrage on the Dukes was relentless as the Wildcats extended the lead to eventually twenty six, 95-69 with two minutes left. That's when McKillop cleared his bench and that would be the final score. Davidson showed incredible balance as six players scored in double figures. Brian Sullivan led the way with twenty three points, Aldridge added nineteen points, while Kalinoski had sixteen points. Barham chipped in with twelve and Ekwu and Watkins each had eleven points. What was scary about this is that the Wildcats second best player, Jack Gibbs is still indefinitely out with a slight meniscus tear in his knee. What might even be more scary is that Kalinoski is the only senior that plays significant minutes for Davidson. As we headed out, I took a picture of the Wildcat statute, which is directly across from the Belk Arena entrance. At a night, it's an ominous sight. And if Davidson keeps playing like they did last night, the Wildcats will be an ominous sight for A-10 opponents for seasons to come.